5K races are a big trend right now, as running has taken over the exercise and sporting world. 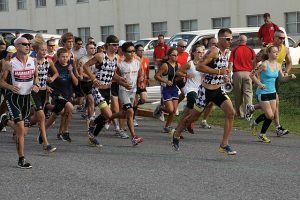 Here in Florida, you are easily able to find multiple 5K races in your area on any given weekend, and many of them benefit causes and organizations you likely support. While running might seem to be just a fun hobby to take up your time and keep you in shape, did you know that running can actually help your career? 5K runs (and other sponsored races like half marathons, marathons, and even “fun runs”) are a great way for businesses of all sizes to get involved with fundraising for a greater good, whether that be an organization supporting medical research, children in need, survivors of various diseases, and more. As an employee, you can contribute to this involvement in a big way if you already run and/or are familiar with the world of racing. If you know your employer is involved in an upcoming race, consider signing up. By showing your support for an event your company is tied to in any capacity lets your boss know that you are willing to go the extra mile (literally) for your career. Often, 5Ks offer businesses the opportunity to have a team from their own company run in the race. Discount tickets, sponsorship advertisement opportunities, etc. are sometimes part of this deal, and that means your employer will need runners. If you find out your company will be running a team in an upcoming race, ask if you could fill one of the spots! Your presence could help your boss gain some valuable advertisement in the community. If you know of an upcoming race that would be a good opportunity for your employer, but they aren’t currently involved, it could be worth discussing it with your boss. Showing that you are willing to take the initiative and look out for chances to benefit the company as a whole and not just your own individual position. Do you have experience in organizing and/or managing a 5K? If you’re up to the task, you could consider asking your boss about sponsoring a race as a company. This is a wonderful time to advertise for your business, and to get involved with other local businesses. While building a 5K from the ground up can be time-consuming, it’s well worth the effort! It’s a perfect way to show off some of your business skills too! We think it’s wonderful when employees use their talents and hobbies to benefit their careers, and running races is a great way to make this happen. Still looking for the perfect job to launch your career? Upcoming 5K races could help with that too! Watch for races that have ties with local businesses and well-known sponsors. These are often the companies that have positions open up on a routine basis, and if you have one of their races on your resume, it gives you a personal connection to the company. Another great way to get your “foot in the door” with local businesses is using a local staffing agency. PHR Staffing Solutions is here for residents in and around the Lakeland, Florida area. We provide the connection with businesses throughout the Polk County region and provide top quality applicants for their staff vacancies. YOU could be the perfect fit for our newest job opportunities, so give us a call or apply for our current openings online.